Each one of our Lavender pearl bracelets is a very delicate jewelry item that will help to subtly enhance any woman’s beauty. They can be worn on their own and help to show any woman’s beauty in a more understated way. The various different designs we have on offer ensure that we have Lavender pearl bracelets that will suit women of all ages. This very minimalistic item of jewelry offers you the perfect way for including pearls into your jewelry box and so for use with various outfits in your wardrobe. 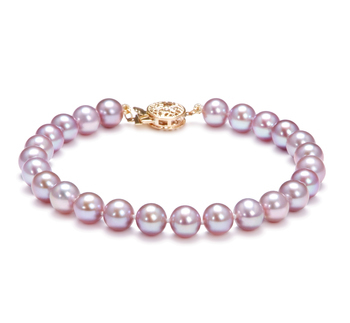 A bracelet that is made up of 6-7mm pearls is perfect for pairing with casual, relaxed outfits. Whereas bracelets that contain much bigger sized pearls would look stunning when you choose to wear them with semi-formal or business attire. A Lavender double strand pearl bracelet doesn’t only look very elegant but also very distinguished. This is the ideal piece of Lavender pearl jewelry to wear on a special occasion, such as your wedding anniversary or your birthday. To further enhance the elegance and beauty of such a piece you could think about teaming it with a matching pearl necklace or earrings, or even both. This style of bracelet is perfect for those who would love to be able to keep up with the latest fashion trends. They will instantly fall in love with a Lavender pearl bracelet with charms attached. Such pieces of jewelry are perfect for young women to wear or those who have a more playful side to their character. Our lavender pearl bracelets comprise some very delicate pearls that will also compliment all skin tones. 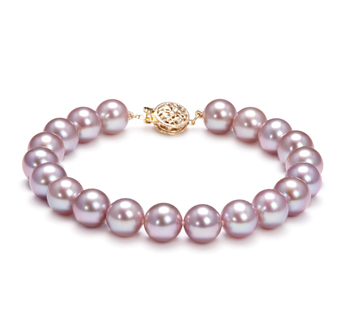 This style of pearl bracelet is perfect for wearing by more mature, refined women that regularly have to attend meetings or important social events. Such Lavender pearl jewelry comes with a very distinctive clasp that will help to add a touch of glamor to more conservative outfits as well add an extra touch of polish to an elegant dress. 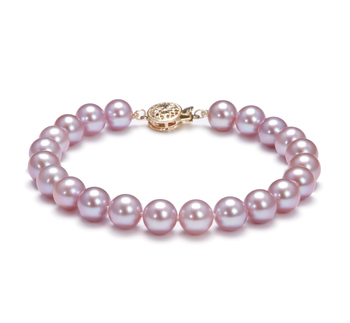 If you have a fair or light complexion then you should look for Lavender pearl bracelets that are a much darker color. Wearing such jewelry will help to bring out the warmer tones in your skin as well as help to make the pearls sparkle even more.